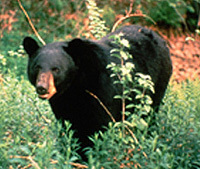 The American black bear is located through much of Canada and the mountains of western and eastern United States. 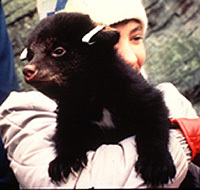 It is the smallest of the North American bear family. Bears are hunted for their fur and meat during a hunting season. Hunters have to get a license to shoot black bears. They are protected in Canada's and the United States' national parks. The teddy bear was made by a toymaker after a black bear cub that wandered up to President Teddy Roosevelt on a hunting trip. When walking, black bears are about 3 feet tall. The length of their bodies ranges between 4 - 6 feet. Their fur is mostly black. However, some black bears have gray or brown coats of fur. They have long claws that are used for climbing trees, digging in the soil, killing food, or protecting themselves. They have sharp teeth and powerful jaws. The female bear weighs over 100 pounds. The male bear can weigh up to 300 pounds. Black bears mate after 5 years during our summer months. It takes about 8 months for the cubs to develop. Birth takes place during the winter months of January or February within the mother's den. Two to three cubs are born blind and without fur. The mother feeds and keeps the cubs warm. They feed from mother's milk from 6 to 8 month's. This means that cubs spend two winter seasons in the mother's den. After that, they find their own homes and hunting grounds. Black bears live for about 25 years. When they are old enough, black bears live alone. They prefer living in the forests and woodlands. Female bears cover a smaller territory than males. That is because females have cubs to feed and protect. A female black bear does not share her territory. Males share up to as much as 200 square miles of their territory. When cold weather begins, black bears find protected places for their homes, or dens. They make homes in hollow logs, in caves, under large fallen trees, or in burrows that it digs. Black bear do not really hibernate. They stay in their dens and are usually awake. However, they are not active. When they come out of their dens in the spring, they are very thin and very, very hungry. Black bears use their claws, paws and jaws to get their food. Black bears are omnivores. Being an omnivore means that black bears eat both meat and plants. Bears climb trees by using a bear hug. They use their powerful claws and paws to climb up a tree. They are looking for birds' eggs and beehives. They always back down the tree. They will also eat smaller mammals such as porcupines and beavers. Black bears also fish by diving or wading in water. They will rip apart rotten logs to eat insects and grubs. Black bears will also eat twigs, buds, nuts, fruit, and tender roots. They have been known to eat part of trees just beneath the tree.